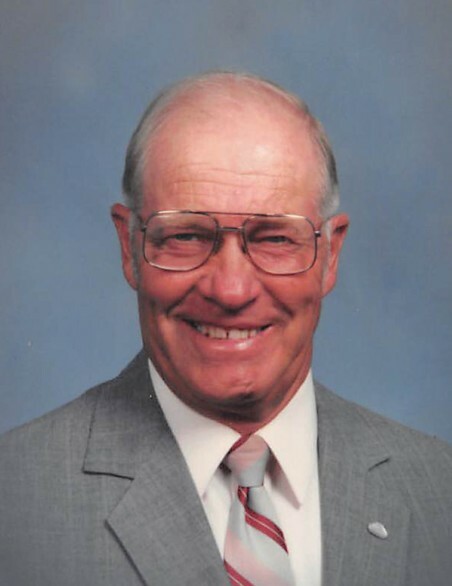 W. Berdell Skogstad, 92, of Hoffman, MN, died on December 4, 2018 at the Barrett Care Center. Berdell was born on August 12, 1926 north of Kensington, MN, the son of Willie and Inga (Wilberg) Skogstad. The family moved to a farm north of Cyrus in 1927. Berdell attended District # 46 & 74 in grade school and graduated from Cyrus High School in 1944. After graduating he attended telephone switchboard school in Passaic, New Jersey. Berdell met Arleen (Jahn) in Cyrus, where she was an elementary teacher. The couple were married in Perham, MN on August 21, 1949. To this union two daughters were born, Lynn and Renee. Berdell first worked as a school bus driver in Cyrus from 1945-1946. He then was hired to be a lineman and manager of the Cyrus Telephone Company. When offered the job of general manager at Runestone Telephone Association, Berdell accepted and the family moved to Hoffman in 1955. After retiring in 1987, he continued to work part time for Runestone obtaining right -of -WAY easements. HE was a U.S. Census taker in 1990 and 2000. Berdell worked as a ski lift operator at Andes Tower Hills for 15 years. He also mowed lawns for several people. Berdell was a member of Lands Lutheran Church and Messiah Lutheran Church where he served as Messiah’s first President in October 1987. He was chairman of the Bethel, Lands and Aeneas steering committee. Berdell was also a volunteer fireman for 25 years. In 2015 Berdell was selected to be Grand Marshall of the Hoffman Harvest Festival Parade. Berdell enjoyed working on engines and brought many motors back to life. He loved sun fishing, especially with his friends, Red, Hank and Raymer. Traveling and camping with his family was the highlight of many summers. Berdell was a family man who adored his wife and girls. He is survived by his two daughters, Lynn and Renee Skogstad of Kerkhoven, MN; brother-in-law, Bernard (Barbara) Jahn of Fort Meyers, FL; niece, Julie Jahn of New Brighton, MN; nephew, Brian Jahn of Fort Myers, FL; and cousin, Donald (Joyce) Skogstad of Fergus Falls. Berdell was preceded in death by his parents, Willie and Inga; wife, Arleen, and several aunts and uncles. In lieu of flowers memorials preferred to Luther Crest Bible Camp and Can Do Canines. Memorial Service: 11:00 a.m., Saturday, December 8, 2018 at Messiah Lutheran Church in Hoffman with a visitation one hour prior to the service at the church.